Body Work: Precision measurement and frame pulls guarantee restoration of every vehicle to pre-accident condition. Lasermate unibody and frame measurements before and after adjustments guarantee accurate straightening. Painting: State-of-the-art prep stations guarantee a clean and efficient working environment. The down-draft paint booth with oven ensures rapid, flawless paint jobs for perfect matches. Towing: We use MNK for towing needs. They have 24 hr. service with secure storage. Car Rentals: For your convenience, we can arrange your car rental needs for you. Estimates: We provide free estimates with our new CCC ONE Estimating System. We are also able to email estimates and photos for your convenience. Detailing: We help you protect your investment with complete auto detailing services. Dent Repair: Less expense, excellent results!! With special tools and training we are able to repair minor dents without disturbing the paint finish. Restoration: From Customs to Classics, we provide restoration the way you want it. 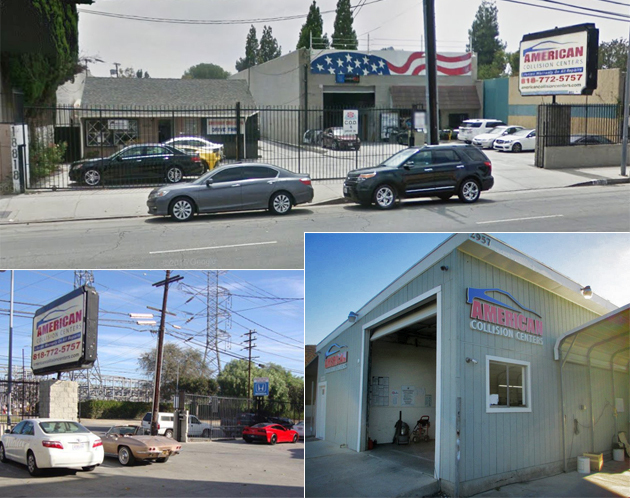 American Collision Centers is an industry leading autobody paint and repair shop serving customers throughout Southern California. We offer a full range of autobody services to our clients, including being an authorized repair facility for Kolbe Honda and many others. We have invested in all the latest specialist tools and diagnostic software that is specifically tailored for the software in your vehicle. Our auto repair shop is capable of servicing a variety of models. We only do the work that is needed to fix your problem and all services are performed by highly qualified technicians and mechanics. Our well trained professionals take pride in providing state of the art customer service and they are all very qualified to handle every situation. Every Job is Personal and if you want the quality you would expect from the dealership, but with a more personal and friendly atmosphere, you have found it. When the unfortunate takes place and you're involved in an accident, give us a call and we will do everything possible in helping you get back on the road fast. We are an industry leading autobody paint and repair shop serving customers in Southern California. All services are performed by highly qualified technicians and mechanics. friendly atmosphere, you have found it. tailored for the software in your vehicle. needed to fix your problem. We offer a full range of autobody services to clients throughout Southern California. Our well trained professionals know how to handle every situation.